I'm a mom with two teens, finding the time to create every day. 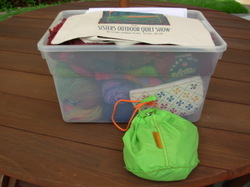 I love color, whimsy, liberated quilting, soothing hand knits and now handspinning! I love to read all my comments, but don't always have time to answer them. Please know that I appreciate each and every one. Please do not use my words or photos without my permission. Thank you for visiting! This is a Flickr badge showing public photos from KnitOneQuiltToo. Make your own badge here. Will Peartin on "Up on a Rooftop"
I finally got time for a photo shoot today at the pool. 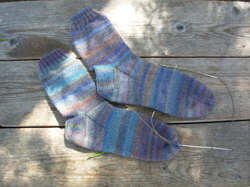 Now that the Trekking socks are done I can say a big thank you to Margene and Norma for hosting the Trek Along! When we were in San Diego I had some time to visit a couple of yarn shops in Encinitas- Common Threads and The Black Sheep. 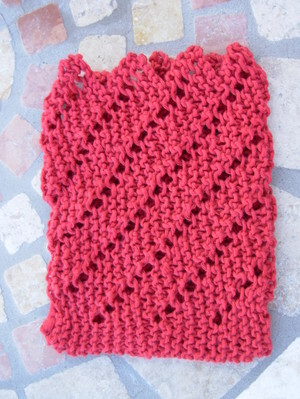 I went looking specifically for the Fiber Trends soap sack and washcloth pattern, Bathtime Blossoms. I got the pattern and 4 balls of various baby cottons to make them for hostess gifts. I'm way late with these, but they will be mailed off in the next few weeks. This is the first soap sack, it will get a twisted cord for a tie. Lastly, I finished two more felted stockings (they will be felted on Wednesday if I get my act together). This is the first, but I made a second later this evening. These are such a quick knit. As I mentioned before, I plan to try to sell some of these during the Live & Learn Conference here in Albuquerque. The conference starts Thursday. 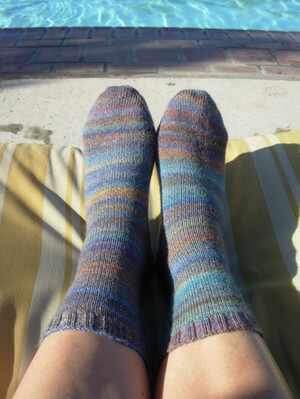 This is Noro Kureyon, colorway #126. Now that I'm using my unschooling blog as more of the travel journal, this one hasn't had the travel photos. So, I leave you with a photo that represents the beauty of today. 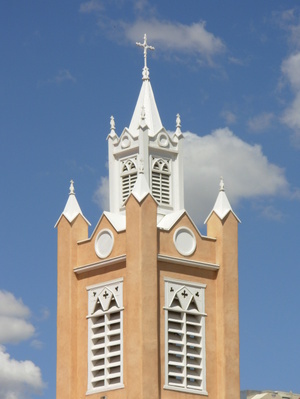 This is the San Felipe de Neri Church in Old Town Albuquerque. 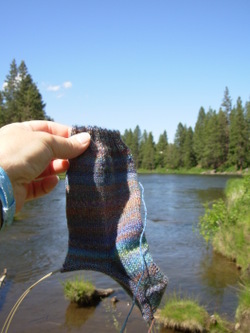 I did actually finish my Trek Along socks today! I will try to get a finished shot tomorrow, but in the meantime, here are photos from Trekking #68's latest Trek through San Diego. Here we are in Balboa Park, heading from the Model Railroad Museum to the Fleet Science Center. This building in the photo was across the street. I'm not sure what it houses, but it's very pretty. As you can see I was only a few rows away from finishing. 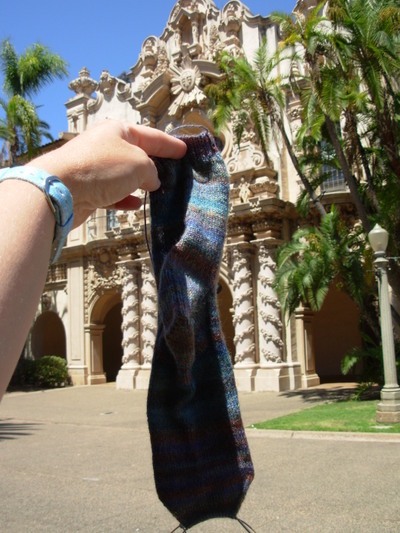 While in the Science Center I finished the sock, so afterwards we headed to Old Town San Diego for lunch. Mark and I lived in San Diego for about a year and a half, way back in 1990. It was fun to visit our old haunts, including the restaurant in Old Town that used to be called Casa de Pico. It is now called Casa de Reyes, but the Bazaar del Mundo (now called Plaza del Pasado) is just as beautiful as before. We had a nice lunch, then walked around the shops. I didn't have a needle to sew up the end, but I had to take photos there anyway. 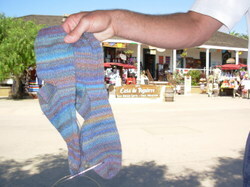 Mark was kind enough to hold the socks, even though we got funny looks from other tourists. Well, there definitely hasn't been as much knitting time as I'd hoped, but I have made some headway with my Trekking socks. I'm about half way down the foot on the second sock, so I might be able to finish by Friday which I believe is the last day of the Trek Along. 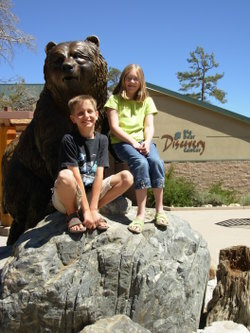 We've had a wonderful visit with my sister here in the Big Bear area. 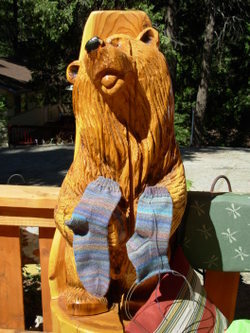 As you can see bears abound here. For more trip photos check my other blog. Tomorrow we head out to the San Diego area, so stay tuned for more! As promised, here's what I thought I could accomplish on the trip. I just realized I've got 4 pairs of socks going. 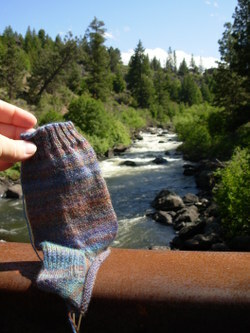 The trekking sock is getting most attention right now because the Trek Along is finished at the end of the month. Also, remember I have a super-secret project that is fairly large and not shown. I may even need to find more yarn for it! Click for bigger pictures. In addition to the trekking socks, I've got two pairs of Socks that Rock and one pair of Mountain Colors Bearfoot. 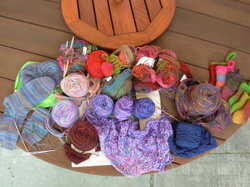 The purple blob is the Charlotte's Web shawl. The blue is another Branching Out Scarf with Elsbeth Lavold Silky Wool. 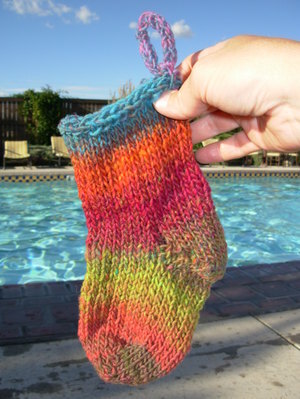 The multicolor is Lorna's Laces Shepherd Worsted for a toddler's sweater. Along the top are several felting yarns to make more of the little felted stockings. I'm going to try to sell some at the Live and Learn conference. The trip is going great so far. 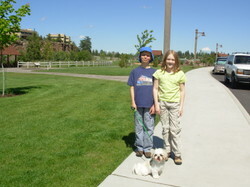 We've had a wonderful time visiting with friends and doing geocaches. It's been a whirlwind so far, so there's not as much knitting time as I would like, but the whole point was to see people and places so I can't complain. More progress photos to come and don't forget to check my unschooling blog in the sidebar if you'd like to see trip photos! 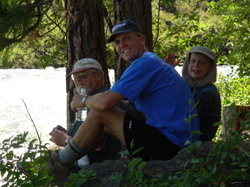 Last Monday my dad and I took our last summer hike together. 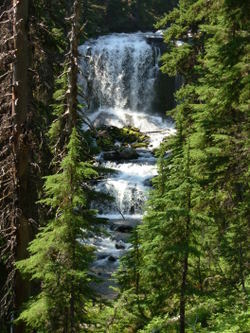 This time it was 6.8 miles starting at Tumalo Falls. 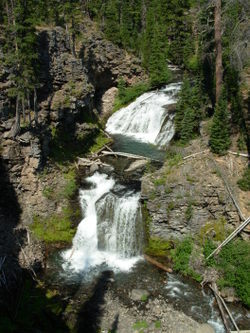 You can drive to the falls from downtown Bend in about 20 minutes and with a very short walk see the view on the left. If you hike up a short but steep hill you'll get the view on the right. 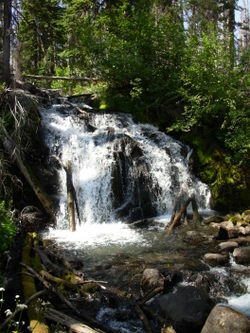 If you continue along the loop trail that meanders past Tumalo Creek you'll see over a dozen waterfalls of various sizes. It's really incredible! 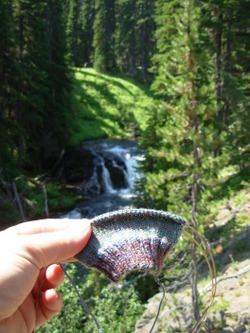 Oh, and yes, the sock came out to see the waterfalls too. 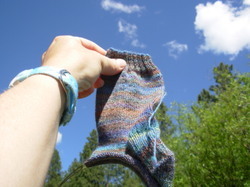 This is the second sock which has grown a bit. It's still in its infancy though. Will it be finished by the September 1st deadline? I'm hoping we'll have at least one more trek while on this big trip. Stay tuned to find out. Last Saturday, my dad and I finally managed to fit in a nice long hike, just the two of us. It was 9 miles and I was thoroughly exhausted by the end, but it was definitely worth it. 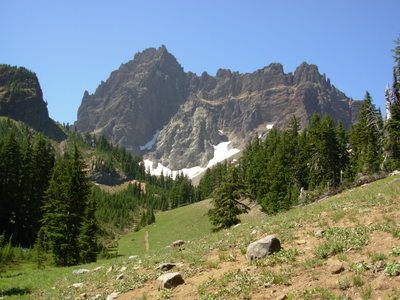 Three Fingered Jack is located in the Cascades just north of the Black Crater Fire which has been in the news lately. We did see quite a bit of smoke to the south, but views to the north we lovely and the views along the hike were breathtaking. 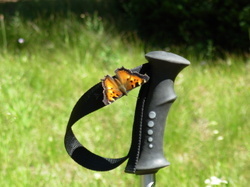 These butterflies were all over next to Canyon Creek which meanders by the trail. 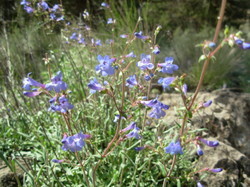 Wildflowers were quite abundant. 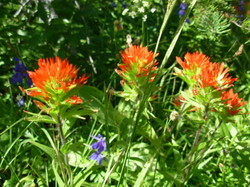 We saw pink monkeyflower, columbine, larkspur, cat's ear, aster, lupine, penstemon and these paintbrush. The hike took us from about 4500 feet to 6100 feet. 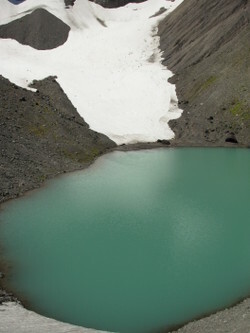 Just below that snow field is a glacial lake surrounded by moraine. We scrambled up the moraine pile to see the lake. After another 1/2 an hour of very difficult climbing we reached the viewpoint. 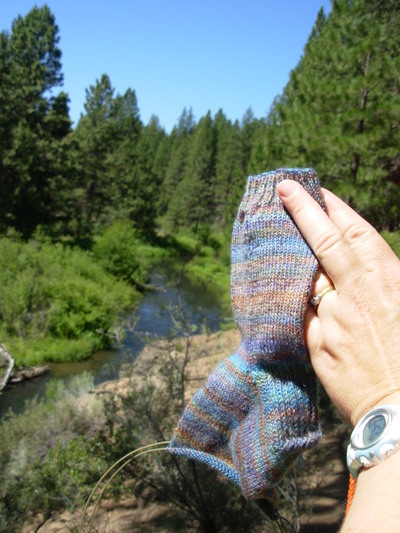 The sock finally came out for a breather at the top where we stopped for lunch. As you can see Sock #1 is done and baby sock is just started. It was such a beautiful day and not windy at the top like usual. In the distance you can see Mt. Jefferson. I even knit a few rounds! On the left is a new flower for me. 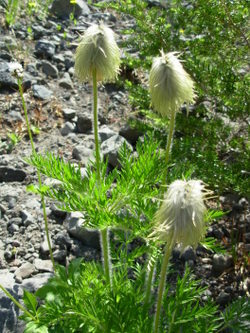 It's official name is Western Pasque Flower, but it's also called Hippie-on-a-Stick! I thought that was very funny. This is how it looks after flowering. 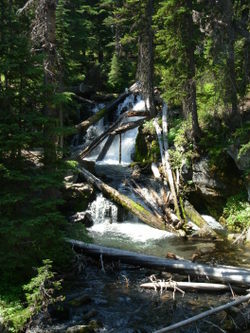 After the main part of the hike and sitting by these beautiful falls for a bit, we took a side trail to Wasco Lake. Here's my dad who just turned 65 last week. Happy Birthday, Dad! 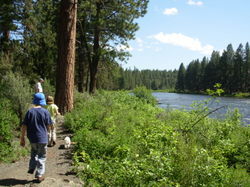 Last week we did another trek along the beautiful Deschutes River in Central Oregon. 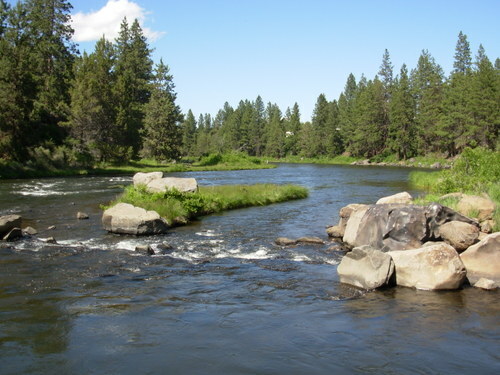 To see this part of the river you only have to drive a few miles from town. 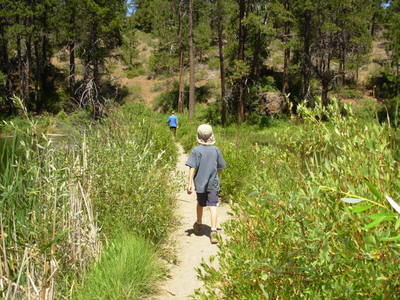 This time we walked the stretch between Meadow Camp and Big Eddy. 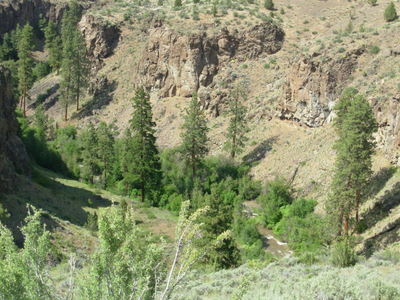 Central Oregon is full of volcanic features so we see a lot of old lava beds. The one on the left is in the middle of the river and is called Lava Island. 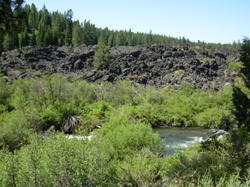 It was caused by lava flows coming down from both sides of the river. 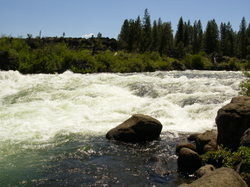 This area of the river ranges from slow moving pools to class 3 rapids. Here are some rafts that came by while we were hiking. It looks like a lot of fun. The sock (Trekking #68) is coming along. I'm about half way down to the toe. 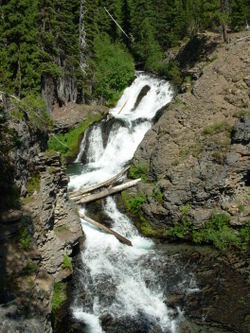 On the left is Bid Eddy, class 3 rapids, we saw a few kayakers come down here and what a wild ride it looks! On the right are my three hiking companions. They've finally accepted the odd request to stop for a sock photo! What a beautiful day for a hike. 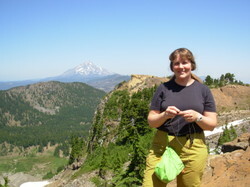 Since then we've had record hot temperatures, so no hiking lately, but stay tuned for the next trek along adventure. 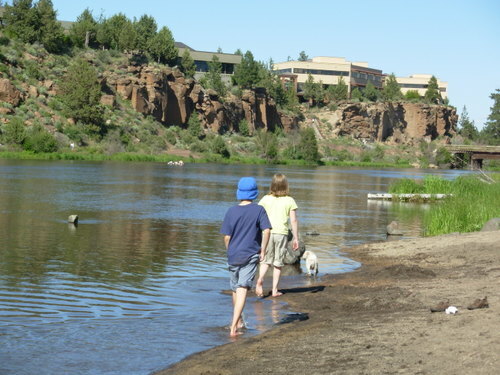 The Deschutes River winds through the heart of Bend and is a focal point of the community. There are people kayaking, canoeing, fishing, rafting and playing in the river on every day of the spring, summer and fall. There is a plan to have a river trail that is continuous throughout the town, but so far it's in separate segments. 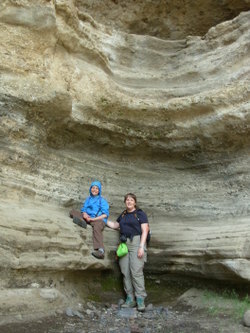 On Thursday we had a wonderful family trek on a stretch of the river in the south end of town. The trail starts at a community park that is only about 1/4 of a mile from one of the big shopping areas and cinemas- the Old Mill District which is right on the river. Here's the start, with the Old Mill behind them. 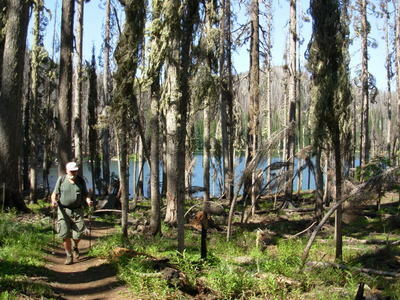 Very quickly you leave the urban landscape and you are trekking in what seems like the wilderness. We have the most incredibly blue skies on these sunny days. 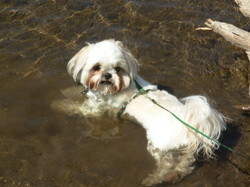 Scrabble was so hot he just lay down in the river to cool down. The sock takes in the fabulous views. After the 3 mile round trip hike, everyone cooled off in the river back at the park. A good time was had by all! 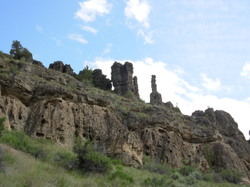 Yesterday, Ryan and I took advantage of another beautiful day in Central Oregon to trek along to Pilot Butte State Park. I should have taken a photo of the butte from down below, in case there are some who don't know what a butte is. Maybe I'll add one later. 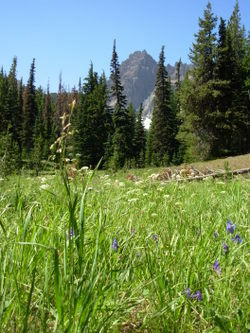 A butte, according to the American Heritage Dictionary, is "a hill that rises abruptly from the surrounding area and has sloping sides and a flat top". 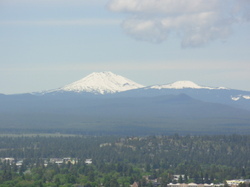 Here in Bend, Pilot Butte is a defining feature of the town, along with the Deschutes River and the Cascade Mountain Range in the distance. 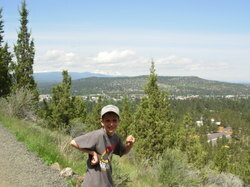 Pilot Butte has a 0.8 mile hiking trail that winds around it to the top. 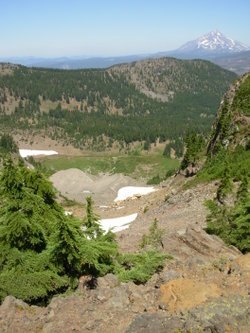 There is also a 1 mile paved road to the top that is closed to cars for a few weeks. We trekked up the trail and trekked down the road, so we got a taste of both. 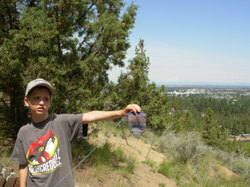 Ryan shows the sock Mount Jefferson (which is hard to see even if you click the photo) and clowns around in front of Awbrey Butte (the Three Sisters Mountains are barely visible in background). Mt. 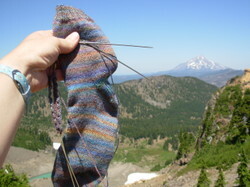 Bachelor (our local ski mountain) looms over Bend, while I add a few rows to the sock. Ryan and I checked out the displays at the top before heading back down. 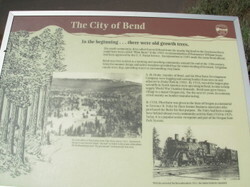 Bend was settled as a ranching and farming community, but quickly became a lumber town. 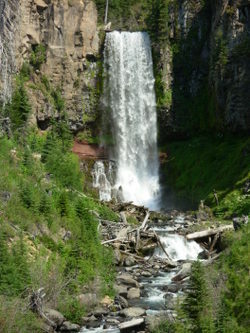 It was originally called Farewell Bend which was shortened to Bend a while later. 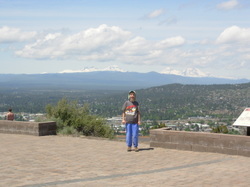 Pilot Butte is smack-dab in the middle of town, so every way you look you'll see the evidence of humans, but it's a great view of the surrounding mountains and a nice trek up and away from the goings-on in town. 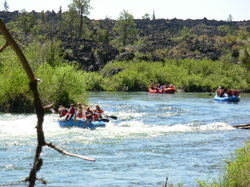 Next up just might be a trekking tour of the Deschutes River! 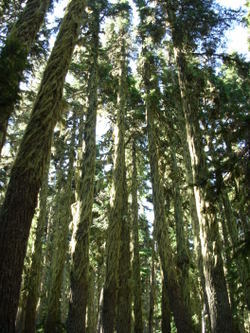 Yesterday, the weather turned nicer and my dad, Ryan and I took a hike to Alder Springs just northeast of Sisters. 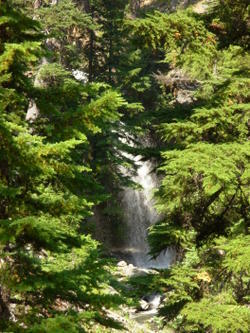 You hike through the junipers and sage down into a canyon where Alder Creek springs from and flows to Wychus Creek. It's a beautiful little oasis in the high desert. 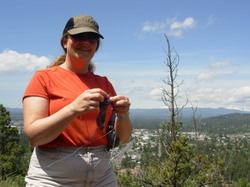 My Trekking #68 socks got to see the lovely views. It was very curious at first that when I pulled out my knitting neither of the guys mentioned how weird that was and why I was taking photos. I thought that they were just so used to my knitting that it could appear any time. Later my dad said he thought it was weird, but he didn't want to say anything! 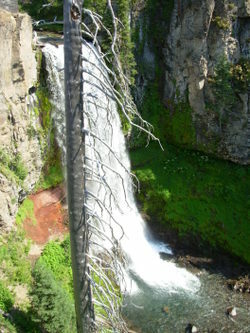 Looking down into the canyon. 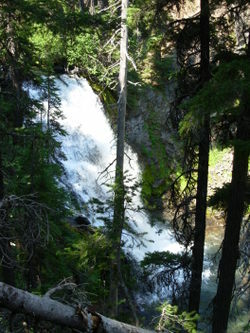 Wychus Creek. 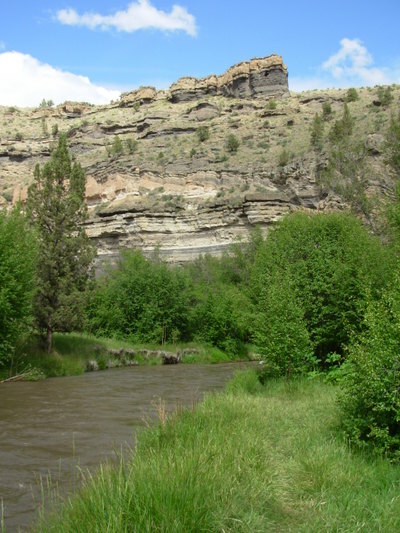 You are supposed to ford the river here and continue, but it was too high and flowing too fast for us to attempt. Ryan and the sock stop for a snack. 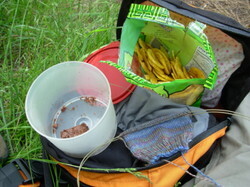 The bag holds plantain chips from Trader Joe's. These are really tasty! I got a hankering for them after our trip to Costa Rica. Knitting! That little pouch can be found here. 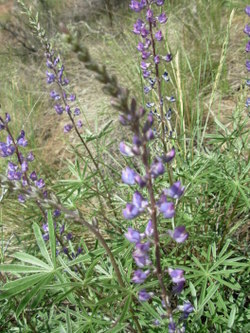 Sage (upper right), Lupine (lower left). This trip was lots of fun. 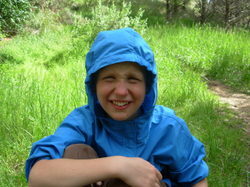 I think Ryan may be my hiking companion this summer!